It was an innocent enough question: "when will I need to replace this cleaning tape?" And I realised that not only did I not know the answer, that in fact, I'd never replaced a cleaning tape in 20+ years of backup work. Sure, I've put one in when I've been deploying a system, but I tend to forget about it after that. Estimates from drive manufacturers suggest that a tape should be cleaned every month. Looking at backup logs, it looks like tape drives request cleaning about every 6 months. But that data is mostly from tape drives that are inside a tape library, so the amount of dust getting in and out will be less than for a standalone tape drive. The spec sheet on HPE's universal LTO ultrium cleaning kit suggests that it should be good for between 15 and 50 cleans. Put together, that means that a cleaning tape should be replaced somewhere between once every year or so and every quarter century, which is not very helpful! I believe the data from the tape drives themselves reporting "I'm dirty" rather than the vendor suggestions, so even taking the low end of the HPE spec sheet, a cleaning tape in a tape library should be good for 7 years. Since that's enough for at least two generations of tape technology to come and go, it's probably safe to assume that you will have bought a new tape library in that time. But if you have multiple tape drives, and it has been a couple of years since you last replaced the cleaning tape, errm, maybe it's worth buying one. I'm not selling tapes at store.data-protector.net yet, so my best suggestion is this vendor on Amazon: LTO ultrium cleaning kit. 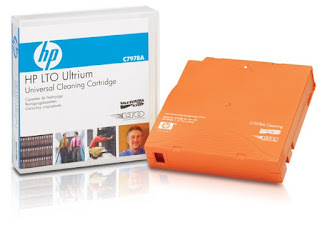 Incidentally, if you do have a tape library and you are running HPE Data Protector, then you will almost definitely want to sign up for the free cloud-hosted Backup Navigator trial here: Free Backup Navigator Trial at HPE so that you can see which are your most unreliable tape drives -- perhaps they need cleaning!